TheBackShed.com - What F&P is it? 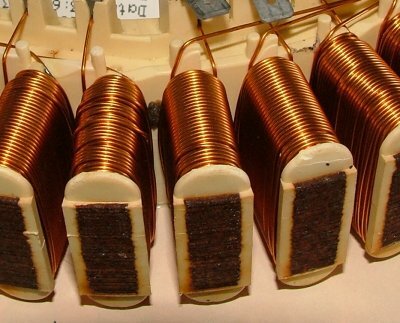 60, 80, 100 series stators, 56 or 48 magnets? Whats the dif? If your new to F&P smartdrive's, you will hear people refer to the different types as 60's, 80's or 100's. 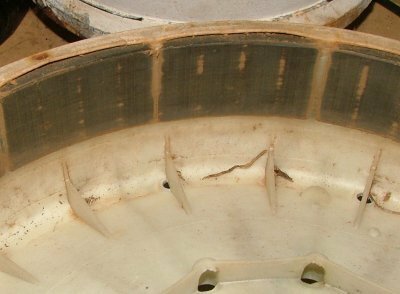 No, these are not F&P model numbers, if you go into your local F&P agent and ask then for a 80 series stator, they will look at you with a blank face. "You want a what!" They are the way the F&P windmill guys know the different types, and it refers to the diameter of the wire used in the windings. 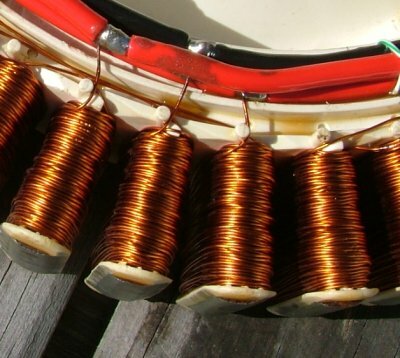 A 60 series has 0.6mm diameter copper wire, the 80 has 0.8mm copper, and the 100 has 1mm copper. I believe the terms originated from Michael at www.ecoinn.co.nz, but I could be wrong. Michael has used F&P motors for water wheels and wind mills for years now and has done some good research into F&P performance. His web site is worth a visit. The 100 series, becoming rare, used in the early model F&P Smartdrive washing machines. Wire size approx 1mm diameter, 42 Poles. This is the very common 80 series. Wire size approx 0.8mm diameter, 42 Poles. 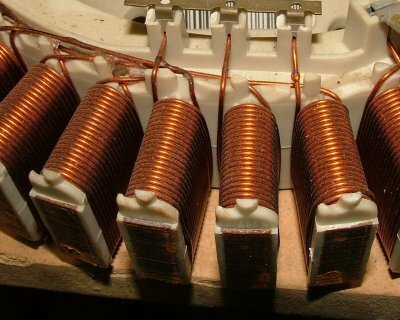 And this is the 60 series, note the messy winding, but this has no effect on performance. 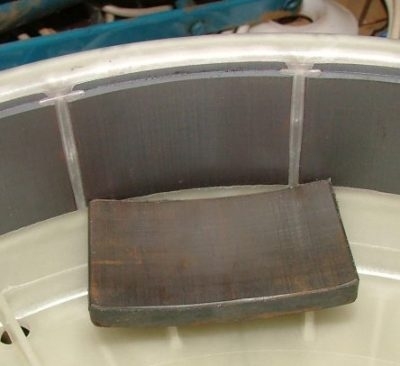 This stator has been de-cogged, note the rounded ends of the poles. Wire size approx 0.6mm diameter, 42 Poles. 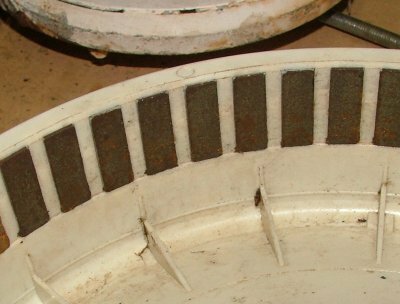 This is the new 36 pole stator used in the very latest F&P washing machines. Note the rounded poles. Wire size approx 0.6mm diameter, 36 Poles. 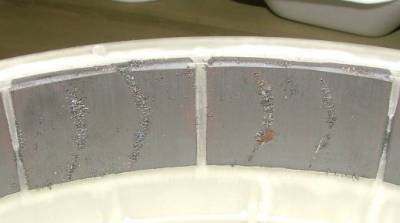 There are three magnet hub types. The early 100 series hub has individual magnets. Again, becoming rare. 56 magnets. F&P later introduced the wider magnets, actually four magnets in one magnet block. I believe this was done to reduce the whining noise when the washing machine was in spin cycle. There are 14 magnet blocks, giving us a total of 56 magnets. You can see the area where the N and S poles meet by traces of rusty iron filings. Below is th latest hub, and suits the 36 pole stator shown above. It has shorter magnet blocks, each with 3 magnets. All up there are 16 magnet blocks, giving us 48 magnets. 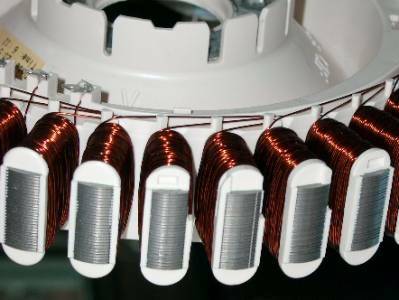 The magnets are also arrow shaped to reduce cogging. We have used this new hub on on the older 42 pole stators with very good results, more info here. Below you can see the arrow shaped magnets with some iron filings on the magnet faces.